SOLVED Adding sustain to a recorded midi track via AP’s Keyboard? I am struggling to find a good solution to this. I have a recorded midi track that I would like to add sustain to, but I don’t want to do it via the midi editor. That would take me hours to get it right. I would like to use the built in keyboard sustain button to add sustain in real time. The only way I have found to do this is to select midi record overdub mode in the Edit menu. Then I can overdub using only sustain via the keyboard. Next I join the tracks and have sustain added. The problem with this is I cannot zoom in in the midi edit window to make adjustments to the sustain as needed, because the blue lines showing sustain just disappear. Maybe that is a bug I’m not sure. I was hoping someone might have a better solution to add sustain. Maybe using automation? I can’t figure out how if it’s possible. Last edited by TomD on Tue Mar 27, 2018 11:51 pm, edited 1 time in total. Re: Adding sustain to a recorded midi track via AP’s Keyboard? I've edited the sustain value in the MIDI editor without problems in the past. One thought: why are you zooming in? The sustain curve is drawn from top to bottom of the screen, so you probably don't need to zoom at all. Just draw on the curve with your finger. Here's an example: you can see the stepped line where I turned sustain on and off using the built-in MIDI keyboard in overdub mode, and then the curve I drew with my finger afterwards. If you zoom in on the editor and the curve disappears, just zoom out again until it comes back. You have the height the screen to create your edits, zooming should not be necessary. Thanks for the reply. I can work in the midi editor and draw in sustain, but I can do a much better job and faster by recording sustain in real time, then make some adjustments in the editor. 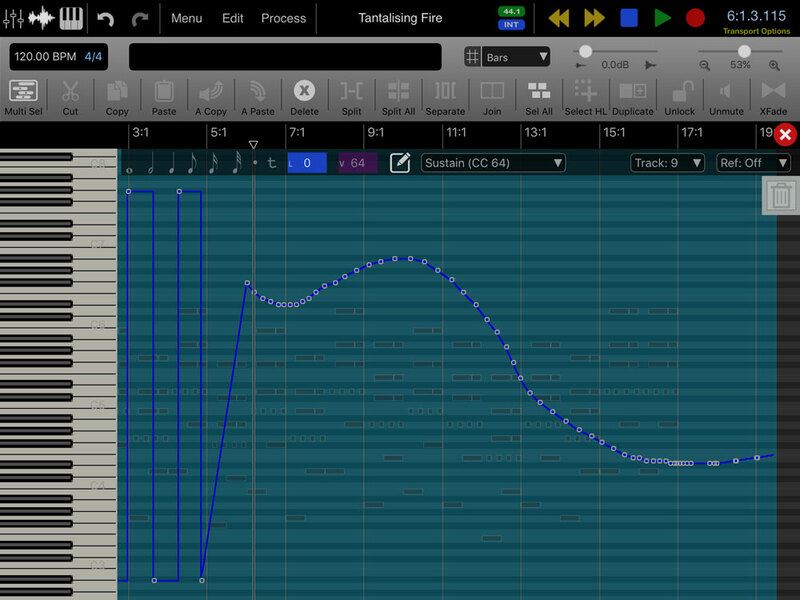 I like the on off a sustain pedal draws in the editor like the first half of your example. I haven’t found an efficient way to draw that in. Sorry, with zoom I meant horizontally not vertically so I can get a better resolution of each measure. The second image is how the midi editor appears when I first click on it. There are about 17 measures between each measure listed. The first image shows what happens if I try to zoom horizontally even a little bit. It would be almost impossible to make any changes the way it appears now. This issue of zooming horizontally to edit sustain only appears after I have overdubbed a sustain recording and joined it with the original midi track. If the two tracks are separate I can zoom normally like what you were doing. It might be a bug related to joining MIDI regions. Can you work without joining them? Also, sustain is just on/off I think so the curve doesn't need to be super-neat - anything above 50% will be on, and anything below will be off (I'm assuming that's how it works) so I wouldn't stress about trying to recreate the very neat curve that happens when you actually record the automation. I think this may be a bug also. Unfortunately my workaround requires the tracks be joined to work the way I want it to. It appears you are correct though, the sustain is on off at %50. I didn’t know this. That makes drawing in sustain more useable for me for now. I’ll give it a shot. I remember having this trouble where the sustain pedal curve would have a break in the middle some how...might be joining regions causes this? I would just delete all the sustain pedal curve data, and then re-record it. To do this, I would setup an automation record on the piano track, play back the track, and just actuate the pedal where I wanted to. Seemed to work, although I was a bit nervous deleting all the pedal data! So you were able to input sustain using your keyboards sustain pedal using automation to an existing midi track? If so, that would work great for me! Could you post a step by step instruction how you did this? What parameter did you have selected in record for automation? I haven’t been able to get it to work that way. If I get some time I will try it. But yes, I did just play the song back and "flip the pedal" as needed and it worked to just record the controller data over top of the already recorded midi notes. Uh oh. I just read the post more carefully...you are wanting to use the Auria keyboard? Sorry inmy case I used an actual sustain pedal. That’s ok. I did some testing and I was able to do the same thing with my keyboard’s foot controller that I did with with Auria’s keyboard, but only using midi overdub. Still had the same issue of zooming in on sustain parameters to edit though. Just updated to 2.14. I can now zoom in on sustain parameters, but I can no longer join tracks and keep both the notes and sustain from each track. It’s now one or the other. However, I found another simple workaround. After recording just sustain on a separate midi track, enter the midi edit mode and select sustain on the new midi track drop down menu. Then tap ‘ select all’ and copy. Then enter the original midi track with notes and select sustain in the drop down. Then paste the sustain parameters. Works fine for what I need to do. Maybe someone else will find this helpful.